For my card today, I used Ovals, Scalloped Ovals, Make A Card #10 Christmas dies. 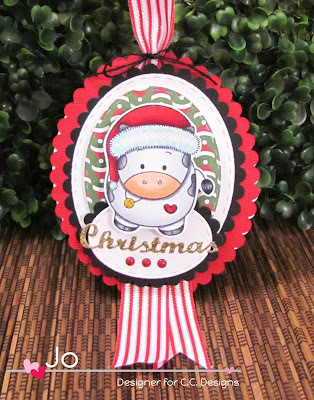 Also the adorable cow from Kitty Bee - Lil Santas. I made a cute cow ornament. This cutie is colored with Copic Markers. I added some Star Dust Stickles to the pom pom and the trim of the hat. I used Yellow Stickles on the cow bell. Come hop along with us and visit the blogs of our awesome Design Team. The next person on our hop is Kathy. 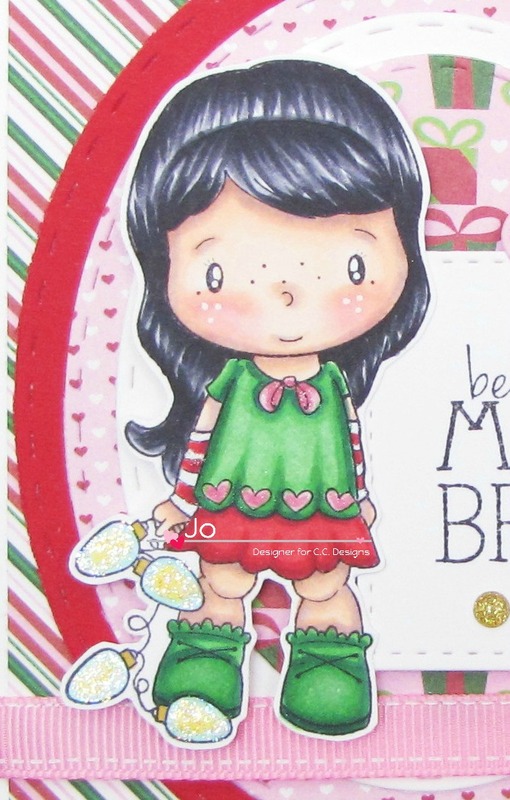 I used the adorable stamp set from Mama Elephant - Charmed and with the coordinating Creative Cuts dies. The images are gold embossed and I colored the wreath in with Copic markers. I added some blush to the owl. I doodled a border with a gold pen. "HELLO, beautiful GIRL" is just one of four sentiments included in the stamp set. The images are popped up on dimensional foam adhesives. Hi everyone, I'm here with a card using the newest stamps from Kitty Bee Designs - Holiday Penguins and Lil' Santas. They are sooo adorable! Many items were used from the October Release, such as the C.C. Designs new dies - Ovals, Scalloped Ovals and Squares. 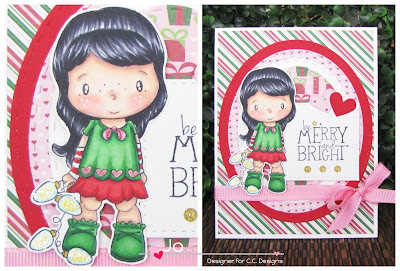 I used the CCD Merry Christmas Paper Pad which coordinates perfectly with the images. I used Copic Markers, Stickles and Wink of Stella in Clear to color the penguins. 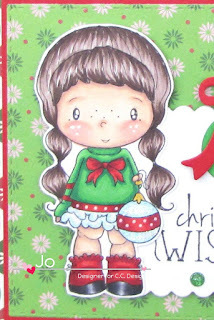 Lastly, the sentiment is from the Pollycraft Christmas Sentiments stamp set. Thanks for stopping by and I hope you are enjoying the October Release! Hi guys, I'm back with another new release from C.C. 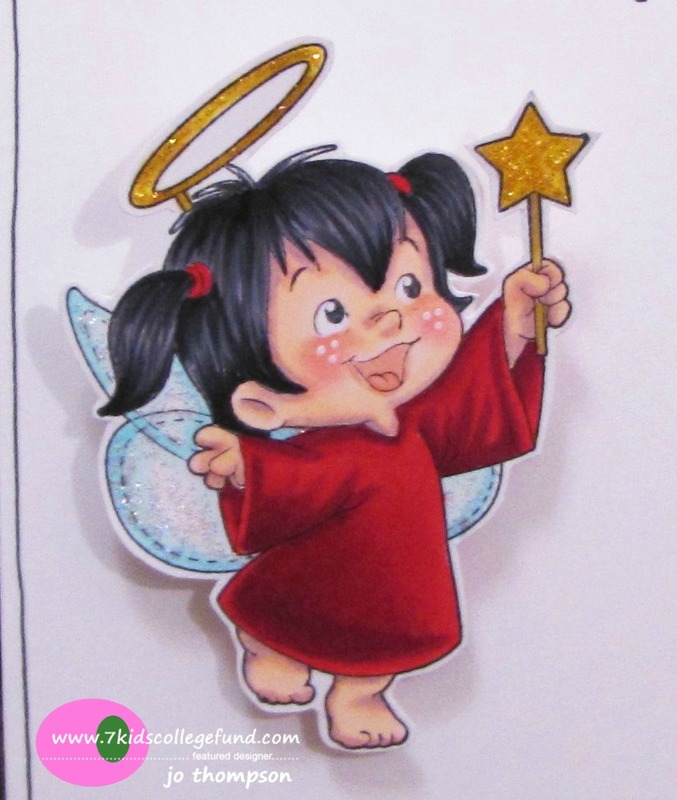 Designs Rubber Stamps, Swiss Pixie Lucy with Lights. The image is colored with Copic Markers and dazzled up with some Stickles in Star Dust. She's holding a string of xmas lights that I colored "clear" instead of multi-colored. The paper is from the Merry Christmas Paper Pad. I also used the new CCD Dies in Ovals. The sentiment is stamped on a die from CCD Squares. The stitched heart die cuts are from the Make A Card #9 Autumn set. Lastly, I tied a Pink Stitched Ribbon bow and added some glittered enamel dots. Thanks for stopping by! Hope you are enjoying this Release over at the CC Designs Blog. Today's card features C.C. 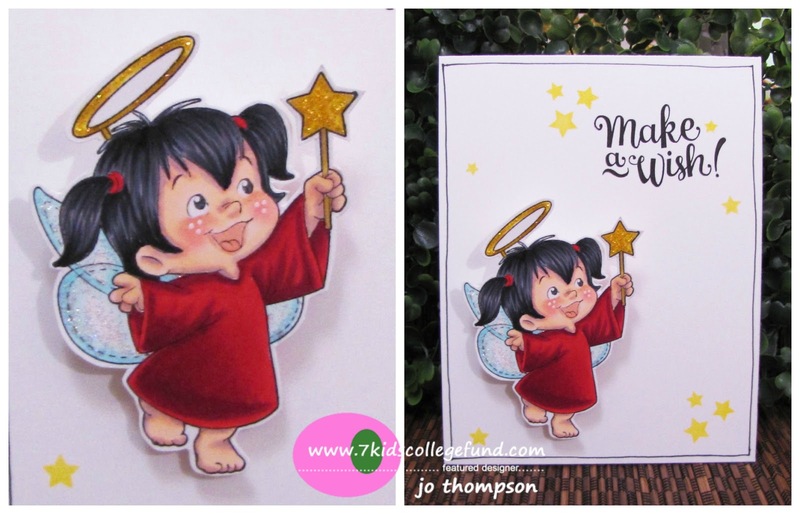 Designs - Roberto's Rascals Angel Twila. I think she's perfect for Halloween or Christmas. She's perfect for celebrating a holiday birthday. I colored her with Copic Markers. Her wings, Wand and Halo are covered with Stickles in Yellow & Star Dust. The sentiment is from Mama Elephant - Make A Wish. I doodled a line border and stamped stars in a yellow pigment ink. To make her even cuter, I adhered her on an Action Wobbles Spring! Grab her today! She's currently on Pre-Order but you can get 10% off her by using the Code: CCD10 (good thru 10/15/15). Today is Showcase Day Two of C.C. Designs Rubber Stamps Release. Don't you just love it! Here is my card using the Swiss Pixie Olivia's Ornament image. Another cutie with an adorable outfit. She is colored with Copic Markers. I added some polka dots with a white gel pen and some stickles to the image. The card is shaped with the Scalloped Squares Dies and nestled perfectly in it is the Squares Dies. 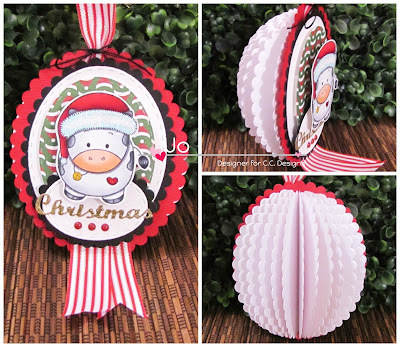 The coordinating ornament die to match the Merry Christmas Paper Pad is from Make A Card #10 Christmas. 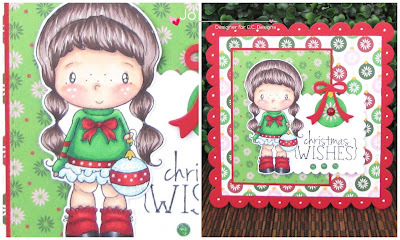 The sentiment is from Pollycraft Christmas Sentiments stamp set. 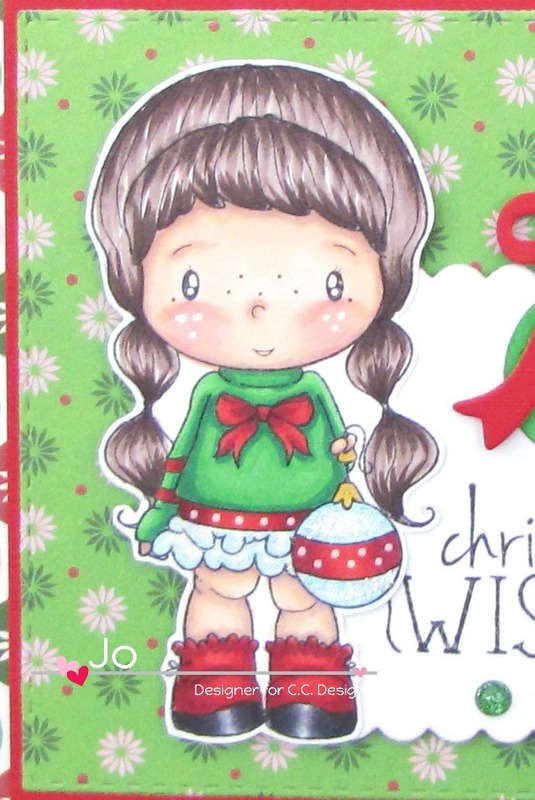 Lastly, I used more of those Christmas Enamel Dots, the red and green glittered dots. Thanks for stopping by! Make sure to check out more of the release from the DT over at the CC Designs Blog.